2/26/2009Share this story on Facebook! 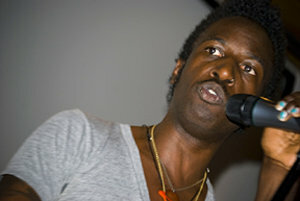 Poet Saul Williams performed to a packed house at IC. The performance offered students a unique and unforgettable opportunity to interact and dialogue with Williams, free of charge. Williams welcomed and urged crowd participation, and students raised questions about topics ranging from Williams’s upbringing to his artistic process. Williams captivated his audience for well over two hours, and then stuck around for pictures, autographs, and one-on-one conversation. Williams co-wrote and starred in Slam, a Sundance Film Festival and Camera d’Or Cannes Film Festival winner. He has also been on HBO’s Def Poetry Jam and is a recurring character on the UPN’s television show Girlfriends. 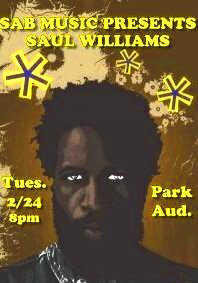 Williams is also a critically acclaimed musician and has authored four collections of poems. His latest book, The Dead Emcee Scrolls: The Lost Teachings of Hip-Hop, gives readers a tour of the history of hip-hop. The event was hosted by the Student Activities Board and co-sponsored by the Center for the Study of Race, Culture and Ethnicity; Division of Interdisciplinary and International Studies; Roy H. Park School of Communications; Department of Theatre Arts; School of Humanities and Sciences; Center for LGBT Education, Outreach, and Services; and the Office of Multicultural Affairs. Wonderful Experience. Candace, you have provided a wonderful synopsis of that evening. Thank you for this.